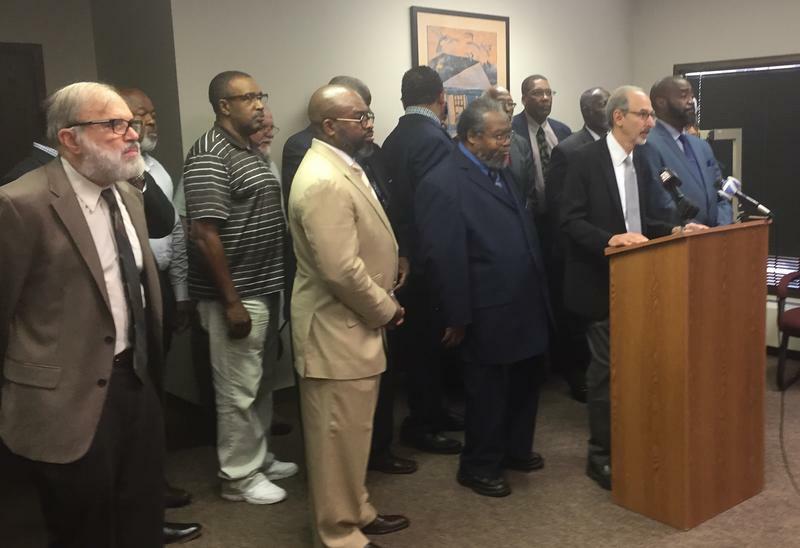 Able Law Attorney, Ellis Jacobs stands with The Clergy Community Coalition to announce the Department of Health and Human Services - Civil Right Division will investigate the announced closure of Good Samaritan Hospital on Dayton's west side. Attorneys representing the West Dayton Clergy Community Coalition group announced Monday the United States Department of Health and Human Services has opened an investigation into the planned closure of Good Samaritan Hospital. Attorney Ellis Jacobs with Able Law says the agency has also asked to meet with Premier Health Partnership officials within the next five days. In May, the Clergy Community Coalition that includes a number of Dayton religious leaders and activists, filed a complaint with the civil rights division of HHS over the planned closing of Good Samaritan, saying the shutdown would jeopardize the health and safety of west side residents. “Premier should be able to answer the question that is being posed here today, Premier, will you be a good citizen and commit to not closing, demolishing, or disabling Good Samaritan Hospital until this federal investigation and any other legal action is complete?” said Jacobs. Premier Health says Good Sam emergency services will end on July 19, 2018, and full operations will cease on July 23. "In light of the now opened federal investigation regarding the closing of Good Samaritan Hospital, I call on Premier to commit to not demolish or disable the buildings on the Good Samaritan campus until this investigation, all legal proceedings and the community planning process are complete. If Premier makes this commitment it will show that it is acting in good faith in assessing all community needs, including health care." The Coalition, backed by many west side residents, allege the closure will disproportionately affect the health of Dayton communities of color who rely on the medical center for emergency and routine health services. Able Law and coalition leaders filed the administrative complaint with HHS in early May and just last week said they were considering a lawsuit to block the closure. Premier has called the decision to close Good Sam a "difficult" one and said, continued operation of the hospital is financially unsustainable. The plan to close the hospital also includes expansion of the Good Sam North campus and Miami Valley South to cover the services currently offered at the Philadelphia Drive location, officials say. In a statement issued Monday, Premier officials said they couldn’t comment directly on the federal investigation -- but that the Good Samaritan closure is moving forward as scheduled.